Refreshingly, one color that top designers are convinced will be a hit during December celebrations is champagne. Most people might wonder what this exactly means since there is sometimes a controversy over what the exact tint champagne actually is. According to the dictionary, the metallic sheen is referred to as, “a name given for various very pale tints of yellowish-orange that are close to beige. The color's name is derived from the typical color of the beverage Champagne.” If you’re still confused, one way to navigate these tricky waters is to rely heavily on blossoms of peach, blush pink and cream. Excellent species that will work to your favor are soft garden roses (which grow in both of these colors), as well as stock, ranunculus and even certain types of Asiatic lilies. You can mix any combination of these together or use one specific variety to feature in your arrangements. Another idea to keep in mind is to create the effect by using props such as holiday baubles, jewelry, ornaments, lights and other trinkets luminescent of the champagne color. By using props, you can add to the theme by placing white or cream blossoms in the center or incorporate pretty tea lights to set off the right glow. In this picture, we can see that the designers relied heavily on this notion by arranging faux stems of spray painted gold poinsettias and silver/pink balls to the side of the container. This makes a gorgeous centerpiece and will live long past New Year’s if you’re planning a second holiday party. 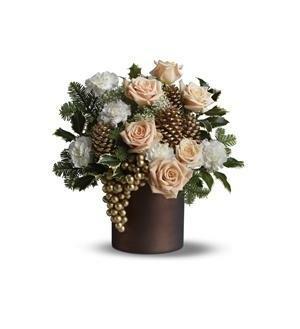 If you think you can pull it off, combine these two theories by mixing together stems of blush and cream roses with glittered ornaments surrounded by a bed of pine. This piece won’t only impress people with the champagne effect but will also show how much effort you’ve put in to following the latest yuletide seasonal trends.